Luxury Waterfront Corner Condo with Spectacular Unobstructed 270 degree views of Lake, Mountains and Downtown Kelowna. East facing deck gets morning sun. West facing deck and living room has afternoon sun and magnificent long sunsets (see photos) over the 70 mile long Okanagan Lake. Natural sunlight streams in from windows on three sides of the unit. This condo is located on the private side of Sunset Waterfront Resort as, unlike the other side of the building, there is no highrise next to it blocking the views and intruding on your privacy. As well it is located on the quiet side of the building away from the noise of the pools and hot tubs on the other side. Newly renovated including hardwood floors. Leave the bedroom blinds open and you will wake up in the morning to stunning floor to ceiling lake and mountain views from main bedroom. 935 sq ft 1 Bedroom, 1 bath unit with den sleeps four with sofa beds in den and living room. If you want a truly memorable vacation this unit will exceed your expectations! 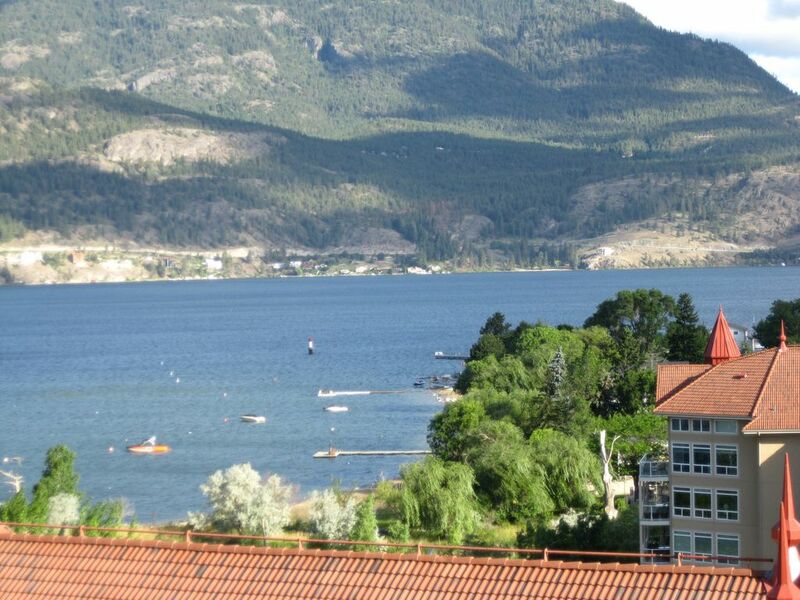 Centrally located in downtown Kelowna this vacation rental condo is a short walk from three Sandy Beaches, Marina, City Parks, Restaurants, Cinemas, Museums, Yacht Club, Boat Launch and a short drive to numerous Golf Courses, Vineyards and other attractions. With a similar climate to Northern California,Kelowna is renowned for its sunny, hot and dry summers with warm lake temperatures and temperate winters. For stays of 2 weeks or more contact us for a quote. When reviewing rates, be sure to select Canadian funds. VRBO sites default to US funds. Email us to inquire about longer term rental rates during the winter/off season. There are no pets or smoking allowed in the condo or on balconies. Fully Furnished with Washer/Dryer, Stove ,Large Fridge with Freezer, Dishwasher, Microwave, Cable, Complimentary Internet, Free Local Phone, Central Air Conditioning, Natural Gas BBQ on East Deck, Gas Fireplace, 40" TV in Living Room, Flat panel TV's in Den and Bedroom, Cookware, Linens, Iron & Ironing Board, Coffee Maker, Patio Furniture and more. Resort Amenities include Indoor and Outdoor Pools, Indoor and Outdoor Jacuzzis, Sauna, Showers, Washrooms, Fitness Room, Tennis Courts, Sandy Beach, Underground Heated Secured Parking. Absolutely No Smoking or Pets in this Immaculate Condo. Property is an excellent and well maintained facility. The access is easy and convenient, specially with its proximity to downtown Kelowna. Views from the balconies are amazing and make for a great quiet evening to relax and take in the panorama. Highly recommend this for anyone planning a visit to Kelowna. Lovely location with amazing views. Host was outstanding! Amazing! Would happily stay here again. Every window has a postcard view! We loved staying here! The condo was very clean, well stocked, and has many windows to showcase those outstanding views of the waterfront and the mountains. The location of the property is so perfect. From the main balcony, you never get tired of watching the sailboats, paddlers, parasailers, people walking and biking. It's easy walking distance to downtown, to the Casino, a variety of restaurants and coffee shops. Having our own indoor parking spot was invaluable. We sure felt like we "belonged" in Kelowna for our stay, and highly recommend this property. Stayed for 4 nites. With our 10month old son. Everything was great. Very nice clean condo..the best views! Would love to stay here again! I rented this condo for my parents. They really enjoyed staying there. Everything was neat and convenient. Great location and great amenities in the condo.